The SC Food Access Task Force was borne out of the SC Food Policy Council with support from the SC Department of Agriculture, to address the barriers to healthy food access in South Carolina. In 2014, the SC Food Access Task Force developed five key recommendations for state and local leaders that would enhance the supply of healthy, affordable food in every community and delivered them in a report titled “Access to Healthy Food in South Carolina.” The recommendations in this document were rooted in a strategy that addresses capital, affordability, supply, planning, and transportation. 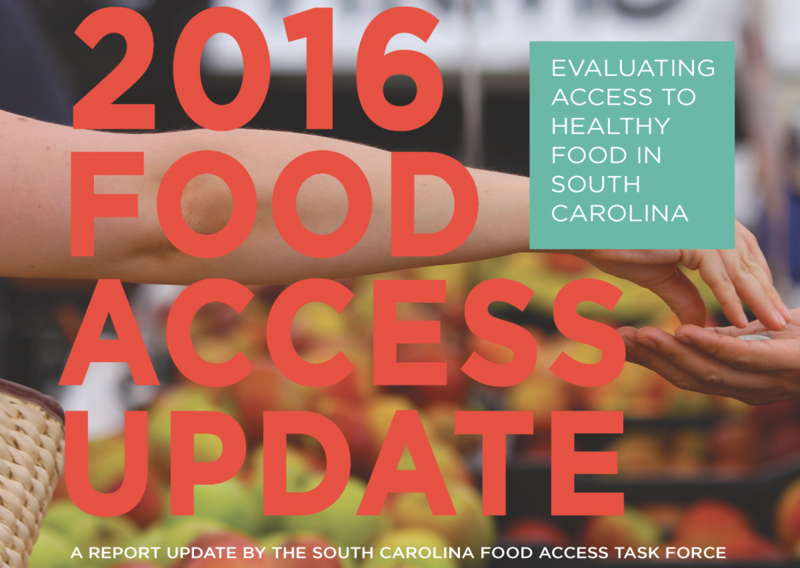 The task force released an update to their initial report at the 2016 SC Food Access Summit today. The update provides a summary of the progress that has been made since the initial report was released along with updated recommendations, success stories, and calls to action. Capital: The General Assembly should continue to provide funding to support the healthy food ﬁnancing initiative, which provides capital to support the establishment, renovation, or expansion of different food projects, including food hubs, farm businesses, mobile markets, small food stores, and large grocery stores that increase access to healthy food. Affordability: Ensure healthy foods are affordable to low-income individuals and families through expanding the number and reach of farmers markets and other healthy food outlets (e.g., direct marketing farmers, produce box programs) that accept SNAP, SNAP Healthy Bucks, WIC and Senior Farmers Market Nutrition Program vouchers, and WIC fruit and vegetable vouchers. Ensure these locations are welcoming and accessible to people of all racial and socioeconomic backgrounds. Supply: Support existing and create new initiatives across the state recruiting, training, and stewarding food-producing farmers. Increase the coordination and support of existing businesses, nonproﬁts, and organizations in SC that are working on local food production, aggregation, processing, and distribution. Planning: Encourage local governments to integrate planning and zoning regulations into comprehensive plans that promote healthy food production, processing, distribution, and access. Transportation: Build collaborative relationships between healthy food advocates, community planners, and transportation agencies to identify and support a wide range of policies and projects that increase food security in communities with limited access to transportation. View and download the full 2016 Task Force Report Update here. For more information about the SC Food Access Task Force and their efforts to increase access to healthy food throughout the state, visit scfoodaccess.org.